PRINCETON, NJ -- Nearly four in five Americans in June, 78%, disapprove of the way Congress is handling its job, marking the 45th consecutive month that more than two-thirds of Americans have given Congress the thumbs down. Americans' high level of disapproval is less about what Congress is doing than about what it isn't doing: putting aside partisan bickering and getting things done. These results are based on a June 1-4 Gallup poll in which Americans were asked to explain, in their own words, "some of the reasons" they either approve or disapprove of Congress. The top reason Americans who disapprove of Congress give for their view is partisan gridlock, named by 28%. Relatedly, another 21% cite Congress' failure to accomplish anything or make decisions, and 11% say Congress puts politics ahead of the country. More policy related, 2% cite Congress' failure to address unemployment, and 1% mention lack of action on the economy. Overall, 59% of Congress' detractors mention at least one of these reasons, making congressional inaction the overwhelming criticism Americans express regarding the legislative body. 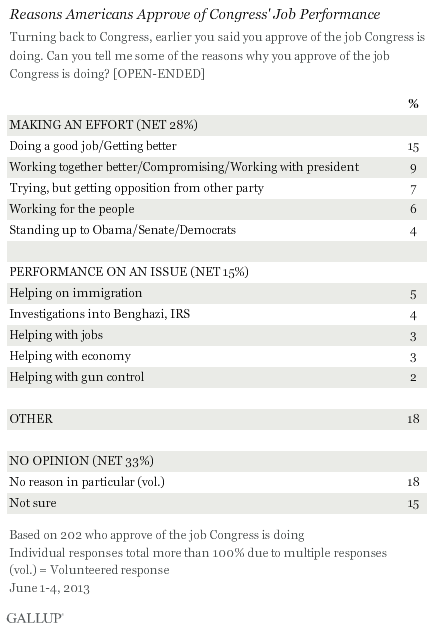 Aside from this, a net 19% of Americans who disapprove mention congressional action on a specific issue, such as healthcare, taxes, immigration, or gun control as the main reason they disapprove of Congress. Nine percent have complaints about congressional ethics or behavior, ranging from lack of transparency and failure "to listen," to dishonesty and frequency of vacations. Another 8% cannot provide a specific reason for their negative view of Congress. Democrats who disapprove of Congress are a bit more likely than their Republican counterparts to cite inaction by Congress as the reason, 65% vs. 54%. This is largely owing to more Democrats specifically citing partisan gridlock and lack of compromise. Republicans, on the other hand, are slightly more likely than Democrats to mention policy disagreement with Congress, particularly related to the budget and healthcare. Nonetheless, even a deeply unpopular institution such as Congress is not without its fans. Seventeen percent of Americans in June approve of the job Congress is doing, similar to the 16% recorded in May, and up slightly from 14% in January. The most common individual response Americans give for approving of Congress is that it's doing a good job or is getting better, mentioned by 15%. Another 9% praise Congress for working better across party lines, while 7% applaud at least one party for "trying." Altogether, Gallup finds 28% of Congress' supporters crediting Congress with some sort of effort. Half as many, 15%, cite congressional success on a specific issue, including immigration or the investigations into Benghazi or the IRS, while 18% mention other reasons. However, the largest category of responses given for approving of Congress is "don't know," as one-third who approve can't articulate a specific reason. Even in this survey of more than 1,500 national adults, there are too few Congress approvers to break out the results by party. Although President Barack Obama's job approval rating is hovering near 50% and Americans' confidence in the economy is approaching positive territory for the first time in more than five years, Congress' job rating remains stuck below 20%. 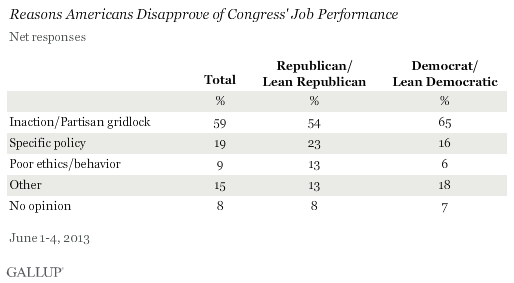 One reason Congress' negative ratings persist could be gridlock fatigue. With party control of the U.S. House and Senate divided between Democrats and Republicans since 2011, Americans may have had their fill of partisan rancor in Congress. Relatedly, many see Congress as simply ineffective -- unable to pass a budget or address the nation's problems in a meaningful way. On the flip side, the best praise its backers can give Congress is that its members are trying. But relatively few can point to a specific issue they think it has addressed particularly well. What this means for the future is unclear. Congress' approval was similarly low in 2012, yet that election resulted in little turnover, preserving a divided Congress. As long as more Americans approve than disapprove of the job their own member of Congress is doing, as Gallup found in May, the status quo could persist. However, with that level of approval falling short of majority (46%), 2014 could bring about more change. Results for this Gallup poll are based on telephone interviews conducted June 1-4, 2013, on the Gallup Daily tracking survey, with a random sample of 1,529 adults, aged 18 and older, living in all 50 U.S. states and the District of Columbia. Although Americans still name the economy and unemployment as the most important U.S. problems, fewer now mention the issues than have in years. The 18% naming unemployment in 2013 is the lowest annual average since 2009. The Gallup Economic Confidence Index was -5 last week -- the highest weekly average since Gallup began Daily tracking in 2008. For the first time since then, more Americans now say the economy is "getting better" than "getting worse." Slim majorities of Americans are closely following the situations involving the IRS (54%) and the congressional hearings on the attack on the U.S. consulate in Benghazi, Libya (53%), although most say both should be investigated.